Day 234 – Have You Any Wool? There is enough ‘seriousness’ in the world to go around the globe WAY too many times. After the events of the past week, we’re ready for some levity and a chance to kick back and have a few laughs. No, we aren’t going to sing Baa Baa Black Sheep, as the title of tonight’s wine might suggest. No, we’re thinking about something that was a long time ago but still has humor today. We’ll paraphrase the actual recording, but suggest that if you want to hear the real thing, you can google it, iTunes it or some other server-it until you find IT! One of his first albums was ‘Why Is There Air’? As a Physical Education major at Temple University, Cosby was quickly cast as the typical ‘coach’ in training–his line, “Ha, ha Phys. Ed. you’re dumb!” Well it made an impression. But, so did his routine about driving in San Francisco, going to the dentist and waiting for the novocaine to wear off, and playing football against Hofstra—“Don’t Touch Certain Parts of Your Anatomy”!! If you have never downloaded, bought, played, listened to or seen this guy in action, Cosby brings life into focus! Which is why we decided to focus on something fun and different tonight. Look at the label. . .notice anything wrong? If wine labels were like minted coins, we’d be ‘in the money’ with a simple little mistake. 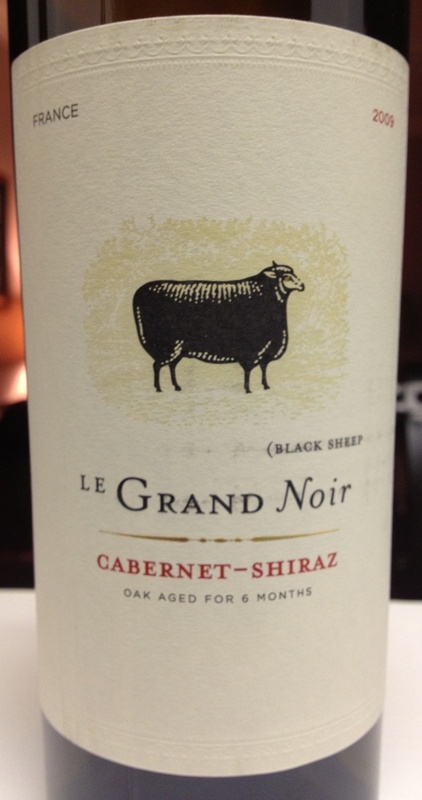 But, we digress. . .The Black Sheep. . .From a country renowned for its wine-making tradition, Le Grand Noir wines offer non-traditional blends from traditional French varietals. In a world where so many things look the same, a wine that doesn’t sheepishly follow the herd. The select vineyards used to produce the wines of Le Grand Noir are located in the notable regions of Minervois and Carcassone. Situated among rolling uplands and broad plateaus between the Pyrennes and “Black” mountain ranges, the diverse soils are comprised of limestone, chalk, clay, granite, and schist. The mild Mediterranean climate provides ideal conditions for producing high quality fruit. What we LOVED about this wine–in true French fashion–it got better and better as it stayed opened. For less than $15 a bottle, you’re going to find this wine a little addicting. It’s got loads of fruit paired with lots of earthy goodness. This is a wine that should cost a lot more than offered by our friends at Twin Liquors or H-E-B! Comedians have come and gone over the past 40 years. Few, if any, have the staying power of Bill Cosby. His routines transcend time to this day. His message isn’t lost among multiple generations and his humor is as clean today as it was back in the mid-1960’s. Yeah, he can deliver an entire routine–have you busting a gut laughing–and not a blue word among his dialogue. Kind of makes you wonder about today’s comedians who rely on profanity to generate laughs. Not much material needed. We think that taking some time to enjoy a good laugh is crucial to maintaining a level of calmness and sanity. So, the fact that our wine has a black sheep on its’ label should give you a reason why we chose tonight’s title. We hope that you’ll enjoy your favorite wine responsibly–because if you enjoyed it irresponsibly, there’d be consequences we don’t want to deal with–and please recycle whenever possible. (BTW—If you stare at the label on the wine bottle, there is a closed parenthesis missing under the black sheep—worth millions? NOT! Have a great evening and we’ll talk with you tomorrow!! Categories: Uncategorized | Tags: Bill Cosby, Black Sheep, Comedians, Comedy, Fatherhood, H-E-B, Hofstra, Temple University, Twin Liquors, Why Is There Air? Le Grand Pinot | Permalink.